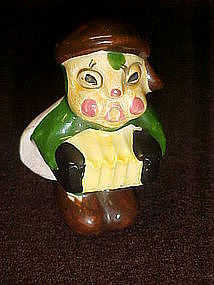 Very old and unique little beetle bug has an anthropomorphic face and is playing an accordian. Hand painted ceramic and marked with a red Japan stamp, No chips or cracks or repairs. Measures 2 3/4" tall. Rare little figurine. I have a photo of the backside which shows his spotted wings if you need to see it.